In January, journalism students from HSU, as part of an investigative reporting class taught by Asst. Professor Marcy Burstiner, set out to understand why public agencies would suddenly shut down a long-standing business central to the North Coast fishing industry. They filed public records requests with the U.S. Environmental Protection Agency, the California Department of Public Health, the Eureka Redevelopment Agency, the Humboldt County Department of Health and Human Services, the Eureka Fire Department and the Eureka building and public works departments. They interviewed officials from many of those agencies as well. Humboldt County Department of Health and Human Services Director Alexandra Wineland initially refused to allow them to interview representatives of the hazardous waste division. Only after a student filed a request for Wineland's expense reports, calendar and cell phone records, did she grant access to Hazardous Waste Supervisor Melissa Martel and senior hazardous materials specialist Jeff Poel, on the condition that they would not discuss the Eureka Ice investigation. In all they interviewed about 50 people over a three-month period. The students involved in the project were: Alyssa Alvarez, Anthony Barstow, Robert Buelteman, Robert Combs, Meagan Dupré, Dashiell Eells, Mark Farias, J.T. Johnston, Leigh Lawson, Jennifer Mackaben, Nathaniel Ochoa, Daniel Penza, Rory Smith, Tom Vidosh and Sara Wilmot. There is nothing like an ice cold drink on a hot, sunny day. The ice cubes clink against the glass and shine in the sun. When you move them around in your mouth, they seem to cool you down from head to toe. Unless you made the ice yourself, it likely came from an ice producer. Until recently, that meant Eureka Ice and Cold Storage, which shut down unexpectedly last year. When it closed, local businesses -- from markets that sell it in 5 lb. and 7 lb. bags to restaurants that serve it up in drinks -- had to scramble. "When we were really busy our ice machine couldn't keep up and we had no place to go," said Joyce Hill, manager of Lost Coast Brewery & Café. "We now have to go to Winco, which is a lot further away. It was really a shame to see a business which has been here so long close down." The closure forced fishermen to scramble as well. They depended on Eureka Ice for flake ice, used to keep their catch from rotting out at sea, and for cold storage of their fish when they came back. 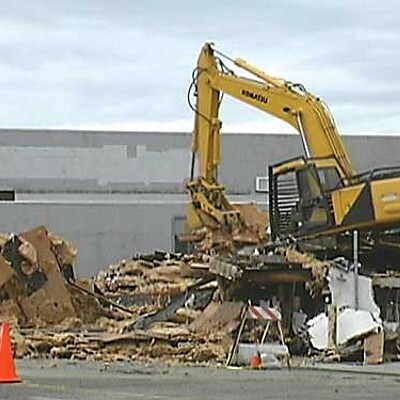 The plant was demolished Feb. 28. Now temporary barbed-wire fences, a broken tape that says "caution," a rusted chain link fence, and moss and weeds surround the concrete foundation that still stands on the Eureka Ice lot, complete with thick, rusty screws and burnt pieces of old insulation. Pieces of wood, chipped paint, ripped insulation and cigarette butts cover the ground. The remaining portion of the business seems deserted. Seagulls circle overhead. The moist air smells like salt water. It is eerily quiet. Graffiti and cobwebs decorate the walls. Trucks are still parked at the loading dock. The sign for Eureka Ice and Cold Storage lies on the rusted slab and an old, empty bag of party ice that the wind blew around the fence lies on the sidewalk. The one-and-a-half-acre lot is listed with Cutten Realty for $850,000. This was once a thriving, family-owned business at the center of the region's fishing industry. "I can remember when I was a kid the salmon boats would be lined up 10 to 15 deep waiting to get ice," said tugboat operator Leroy Zerlang, a lifelong resident of Humboldt County and chief historian at the Humboldt Maritime Museum. To understand the collapse of a long-standing business that so many people depended on you need to read through a ream of documents. That's because the Humboldt County Department of Health and Human Services, which ordered the company to shut down pending seismic upgrades, will not discuss the case. Neither will the family that owned it. Through e-mail, Dennis Hunter, a longtime member of the Harbor Commission, explained how he took ownership of the company in 2006 upon the death of his father, Gilbert Hunter, who bought the business in 1981. Dennis Hunter said he left the operations of the business to his brother and he politely declined numerous requests for an interview. "I feel that the Eureka Ice & Cold Storage facility is now old news," Hunter wrote. "Our family no longer has that business. In fact, we are leasing a portion of our property to Arctic Ice, a company headquartered in Coos Bay, Oregon. Arctic Ice provides party ice to many businesses in the area. The flake ice for commercial fishermen is now being offered by Pacific Choice and Caito Fisheries." After the plant shut its doors, the Hunters decided to close it for good because they decided they could not afford the seismic upgrades. Were the building not in an earthquake region, it would likely still be in operation today. And that's disturbing. Because documents obtained through the U.S. Freedom of Information Act and California Public Records Act from the many public agencies that oversaw Eureka Ice and Cold Storage -- the U.S. Environmental Protection Agency; California Department of Public Health, the Humboldt County Department of Health and Human Services; and Eureka Fire Department, Building Department, and Public Works -- go back more than a decade. They detail the company's slow deterioration. The mystery isn't why the business closed, but why it stayed open for so long. California health inspector Amir Javed walked into Eureka Ice and Cold Storage in July 2007 to find flaking paint on the floor in the seafood and ice storage rooms. In his Food Activity Compliance Tracking Form, he noted that two large containers were placed along the middle of the wall of the warehouse to capture falling ice from the ceiling. In the bathroom he found "extremely dirty" cardboards that covered the floor. And the toilet was "encrusted with filth and human waste matter," he wrote. He noted that a third of the ice in the plant was for party ice that people buy in markets. But the company had failed to conduct a number of bacteriological chemical and physical tests on its finished ice on a regular basis, as required by state drinking water standards. As he noted, a manager at the plant told him that "[t]he firm has never conducted any of the tests listed above on its finished ice in the past." In Aug. 2008, another state health inspector, Jon Spencer, visited Eureka Ice. He, too, found that the company had not performed required tests on the finished ice. The roof was still unstable and flaking paint still posed a contamination problem. On the other hand, the bathroom had been renovated. It "was in excellent condition complete with hand washing signs," Spencer wrote in his report. The California Department of Health Services wasn't the only agency concerned about the condition of the plant and how it made, stored and packaged ice. In January 2008, the Humboldt County Environmental Health Division issued Eureka Ice a notice of violation because it lacked a seismic assessment and it stored anhydrous ammonia, a potentially dangerous chemical. In July 2008, EPA enforcement coordinator Mary Wesling drafted a letter to County Hazardous Materials Unit Supervisor Melissa Martel warning of the potential danger were an earthquake to happen. "Eureka Ice is located only two blocks from Old Town and Downtown Eureka," she wrote. "An ammonia release is a threat to the surrounding community." Anhydrous ammonia is a hazardous chemical used as a coolant in the ice-making process. "Anhydrous" means "without water." Though stored as a liquid, the chemical turns to a gas when it comes into contact with oxygen. In its gas form, anhydrous ammonia is unstable and seeks water to make it stable. It is commonly used in large-scale commercial refrigeration systems. The ammonia is sealed inside the system and continuously cycles from liquid to gas form, removing heat and creating refrigeration. Anhydrous ammonia is ideal for cold storage because it is inexpensive, said hazardous materials specialist Robert Burke. Your fridge at home uses freon, not ammonia. Freon is used in small appliances. Burke said it would be too costly to use freon in the mass quantity needed for cold storage facilities or ice plants. A fire marshal for the University of Maryland, Burke is a veteran of 30 years in fire and emergency services. He wrote a book titled Hazardous Materials Chemistry for Emergency Responders. If a person comes into contact with ammonia gas, he said, prolonged exposure could potentially shut down the respiratory system. At the very least, someone who comes in contact with the chemical experiences a burning sensation pervading the skin and eyes. "If a person comes into contact with liquid anhydrous ammonia it will cause serious frost bite and burns," Burke said. "If a person is surrounded by the gas and can't get away, it will kill them." When an ice-making system works properly, Burke said, the chemical is contained within it, and there is nothing to worry about. It is when the system fails or a pipe begins to leak that the situation becomes dangerous for anyone nearby. "Anhydrous ammonia tanks need to be placed in a place with no population," he said, "just in case of the event of a release." HSU Chemistry Professor Bill Golden said no ammonia would ever leave a closed cooling system and it would never touch things meant for consumption as long as it is properly handled and regulated. If it were to leak, he said, an ammonia cloud would vaporize and dissipate as long as the wind is more than five miles an hour. According to the National Weather Service, wind patterns in Eureka are characteristically sporadic. There are many days, particularly in the summer, in which Eureka experiences winds of five miles per hour or less. Meteorologist Troy Nicolini said that winds typically blow stronger during the day. And Tom Manoli, environmental health and safety coordinator at HSU said that an ammonia cloud would take longer to dissipate on cold days. In March 2003, SHN Consulting Engineers and Geologists, a firm that provides planning and surveying services to northern California, did a preliminary seismic assessment for the ice house. In it the firm mapped out a worst case scenario for an ammonia leak in the event of a sizeable earthquake. It shows downtown Eureka and a circle stretching from Woodley Island to Harris Street and the Bay to the Eureka Slough. Eureka Ice lies at the center of the circle. Anhydrous ammonia leaks have occurred throughout the country. In Riverview, Fla., in 2005, three teens drilled into an exposed pipe that carried anhydrous ammonia to local farms. The teens had heard rumors of money being buried in the pipe. One of the teens reached the center of the pipe. A gas cloud knocked him out. Doctors treated him for second-degree burns to his neck and groin. Firefighters ordered the evacuation of 3,000 residents while they sprayed water into the air to try to dissipate the gas. In Morro Bay, in 2001, a 300-gallon tank of anhydrous ammonia was punctured. The chemical leaked, and 3,500 residents in the surrounding area had to evacuate. And in Orrtanna, Penn., back in 1993, a cold storage worker died from ammonia exposure when a valve leaked anhydrous ammonia into the facility. Sixteen years later, ex-police chief Billy Sanders still remembers. During the rescue attempt, he said, ammonia vapors burned four firefighters who responded to the call, sending them to the emergency room. The men had duct-taped their sleeves to their gloves, he said, but ammonia had burned them through tiny gaps in the tape. The worker who died turned out to be a volunteer firefighter. "We had a slim hope it wasn't him but we pretty much knew it was," he said. "He was a good man, a family man. Probably the best type you could ask for." There have been multiple leaks of ammonia from Eureka Ice over the past two decades. In March 1994, a pipe leaked 764 lbs. of anhydrous ammonia over an hour and a half. In 2002, a man walking his dog along Waterfront Ave. identified a sharp odor and called Eureka fire department. When firefighters arrived on the scene they traced it to an ammonia leak at Eureka Ice and blocked off the road. In Jan. 2003, an engineer on duty noticed a strong ammonia odor and found a leak. And in July 2008, inspectors from both the U.S. EPA and the Humboldt County Health and Human Services Dept. found ammonia leaking from a valve flange and had to leave the area. Eureka Ice had undergone annual environmental inspections for years. Inspectors repeatedly issued citations for failing to clearly label containers of hazardous waste and sometimes for having no labels on those containers at all. On multiple occasions, the company had also been cited for improperly dumping ammonia. In 1997, it had been caught disposing ammonia through an outside floor drain, in violation of the municipal code. 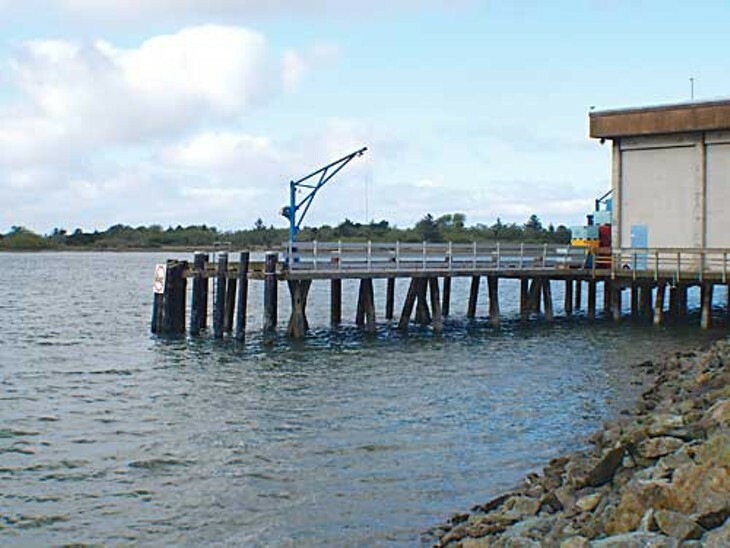 And last year, after the county and EPA ordered Eureka Ice to shut down pending a seismic assessment, wastewater management workers doing routine inspection at a lift station on Waterfront Drive were overwhelmed with ammonia fumes. Justin Boyes, the wastewater pretreatment coordinator for the city, found that workers at Eureka Ice had been pouring an ammonia solution down the drain. The city fined the plant $10,000 for that last incident, which Eureka Ice paid. Boyes said the business did hold an emergency permit allowing them to mix half the solution with water before pouring it down the drain. But this wasn't an emergency, and Eureka Ice did not properly dilute the mixture. "As far as the general safety of the public and the bay, the emergency mixing it with water and the slow discharge to the sewer is a good system, when the proper notifications are made," he said. "The only other feasible alternative is just to take it and mix it with water and have it hauled off as hazardous waste. You cannot discharge it to the bay. It would kill marine life so quickly. And the discharge of gas to the air would kill people in Old Town." It wasn't until news accounts of the shut down of Eureka Ice did workers and residents in the area have any inkling that they lived so near to a potential danger. "I work in Old Town, and the fact that ammonia was so close by is really, really scary," said Sierrarose Pryzabyla, an employee at Belle Star clothing store. "I had no idea I was in such danger." Jeremy Yeo has worked at Los Bagels in Old Town for two years. "I had no clue whatsoever," he said. "I know that we live in a seismically unstable environment. I've felt numerous earthquakes. Not only could an earthquake make those tanks spill their contents -- what about tsunamis? That stuff could get washed right back out into the water. I'm quite surprised that, living in a sustainably-minded community, we haven't found another, safer way to make ice." Eureka resident Jennifer Graham lives blocks away from the old Eureka Ice site. "I feel like I should have known about this. I kind of operate under the assumption that if you're living near some kind of industry that's using pollutants that are really dangerous for you, it should be well known." At the least, Graham said, she feels as if she should have known what to do in the case of a dangerous leak. Burke said that under the federal Emergency Planning and Community Right-To-Know Act a community has a right to know where certain chemicals (including anhydrous ammonia) are located, what the hazards are and what to do in an emergency. He believes that there should be plans in place to shelter occupants or evacuate them during a release, whichever is more appropriate under the circumstances. The community should be educated as to what shelters are in place and what to do if an evacuation is ordered. Eureka Ice had a risk management plan that it filed with Humboldt County Department of Health and Human Services but that didn't include an evacuation plan, said Jeff Poel, senior hazardous material specialist. "An evacuation plan isn't part of it," he said. "It's a prevention program to prevent releases." Eureka Ice was supposed to have a series of checks and balances in place, as well as an emergency response system for notifying fire and other public safety agencies in the event of a release. But the plant had been cited repeatedly over the years for having open containers of hazardous materials that were poorly labeled or had no labels at all. And it was cited repeatedly for failing to properly train its workers to handle dangerous chemicals. The July 2008 joint inspection found a preventive maintenance program to be "inadequate to non-existent." Not far from where Jenny Graham lives is the office of Humboldt Baykeeper, a nonprofit organization whose mission is the protection of coastal waters. Director Pete Nichols worries that too little is still known about Eureka Ice, particularly since the plant's workers were caught dumping ammonia down the drain. "Dumping into the sewer is not only illegal but it ends up in the bay," he said. "The District Attorney should have taken more action. A lot was swept under the rug about the sewer drain dumping. Having those kinds of operations in a community could potentially be dangerous and should be prioritized. The leak could have impacted air quality and human health. It was one of those incidents where you wonder: How much more of these types of incidents are happening without us knowing about it?" Nichols said he tried to get information about the ammonia leak discovered during the 2008 joint inspection, but the Department of Environmental Services refused to talk to him about the case. "They said they would get back to us," he said. "If they do have any information, though, they have not shared it with us." District Attorney Paul Gallegos said he first learned that ammonia had been dumped down the drain through Nichols. But he believes that county environmental services was on top of the situation. "We have agencies that work to monitor these people and their violations," he said. "The information I have is that they are fairly successful in doing so. We're reliant on those agencies to do their job and forward relevant information to us, and certainly not to forward inappropriate information." He said his office would have stepped in if he had received evidence of illegal activities or harm to the public. "If I had reliable, admissible evidence that dumping from Eureka Ice that went into the bay or that it had harmed people -- and I am not saying it hasn't happened -- I would be very interested in assessing what consequence to apply," he said. His office is also located within the worst-case scenario zone. But that doesn't bother him. "Not if they are doing everything the way they should be doing," he said. When the ice plant closed, it left markets and restaurants without a local supplier for bagged ice. Jason Worrell is the frozen foods buyer for the North Coast Co-op in Eureka. It sells about 50 bags of ice a week around this time of year, and that will go up in the summer. The store received no notice that Eureka Ice would shut down; he knew when he read about it in the newspaper. Soon after it closed, ice supplier Arctic Ice of Coos Bay stepped in with ice deliveries. "I was happy that someone else showed up, because they are not going to open a commercial ice house over night," Worrell said. "It was a good thing they came to fill the void." But Arctic Ice doesn't supply the flake ice the fishermen need at sea. County Supervisor Bonnie Neely said the county felt the situation was urgent, because an estimated 525 fishing jobs were at stake. "We felt if it went for another season with no ice available, that the fishing fleet would start looking at other options." Cindy Trobitz-Thomas, director of redevelopment and housing for Eureka, said the city, too, knew it couldn't waste any time. "The city realized there was a need," she said. "If you have fish, you need ice." 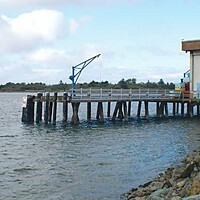 To make sure fishermen have a source for flake ice in Humboldt County, Eureka is using $500,000 in grant money from the Headwaters Fund and $250,000 from the Eureka Redevelopment Agency to contract with frozen food company Pacific Choice Seafood for a new ice plant on a publicly-owned pier adjacent to the Pacific Choice operation. Fishermen will still have to seek out other ways of storing their product, however, as the new facility will only provide ice, not cold storage. The new ice machines will be installed adjacent to Pacific Choice's dock and will use anhydrous ammonia. 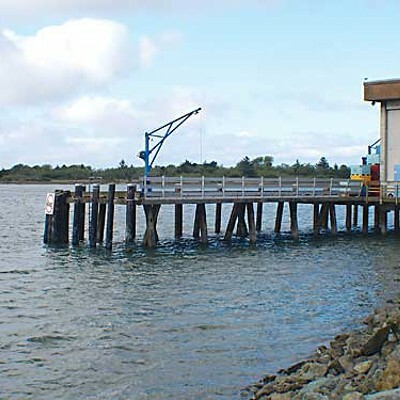 Humboldt State Economics Professor Steven Hackett questioned the pressing need to replace the ice plant, given that the fishing industry in Humboldt County makes up just 5 percent of the total economy. "On a good year, it probably brings in about $10-20 million," he said. The fact that the county had to scramble to find a substitute for Eureka Ice is surprising, considering that the building had been falling apart for years. By the time the county and U.S. EPA shut it down, the roof was so dilapidated that the ice that had built up over the years was supporting the structure. When the public agencies ordered Eureka Ice to remove the anhydrous ammonia, the ice melted and the roof collapsed. If you had visited Eureka Ice six months ago, this is what you would have found: An empty, taped-off parking lot around a building that looked like it could come crashing down any minute. Where the walls met the foundation, they were cracked and seemed to bulge out. In the back a dilapidated construction trailer had a barely legible sign that read Eureka Ice & Cold Storage Office. The building looked to have been vacant for many years, though it had only been closed for a few months. The plant was demolished on Feb. 28. "It was a complete dump," said fisherman Bob Repair. He used to store his bait at Eureka Ice. Now he does most of his fishing out of Crescent City, so he stores his fish there. Steve Modine has been a bartender at Steve and Dave's, a waterfront bar in Old Town. Modine didn't need the newspapers to tell him what was going on at Eureka Ice. He heard about it from the fishermen who come into the bar for coffee each morning. "Fishermen will always talk to you," he said. "All the guys that went down there told me it was falling apart. The only thing holding it together was ice." Eureka City Engineer Kurt Gierlich said Pacific Choice Seafood Company is a different story. He called it a "first-class building." The Eureka Ice House was "just an old building that hadn't been maintained," he said. Managers at Pacific Choice were no more forthcoming about their business than the Hunter family was about Eureka Ice. They declined repeated requests for interviews. But health inspectors who visited the Pacific Choice plant over the years have given it a clean bill of health. And when you visit Pacific Choice's building the difference is visible. There, at least, the pipes are clearly labeled. 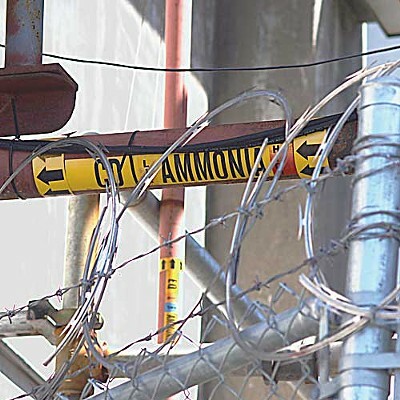 They read: "Danger: Anhydrous Ammonia." And inside the restroom, the toilet sparkles.